The German army utilized two basic models of flare pistols, with one having a short barrel and the other a long barrel. Both of the basic flare pistols were issued with a specific holster and were capable of firing over forty assorted flares with different functions and purposes. 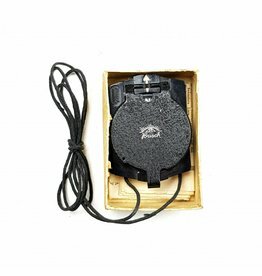 The black coloured holster is made of simulated leather (Presstoff) with with blackened leather and steel fittings. The holster is Waa marked, the holster is in good condition. Complete with two belt-loops and two D-rings on the back. See also the other advert with an early pattern cleaning rod. 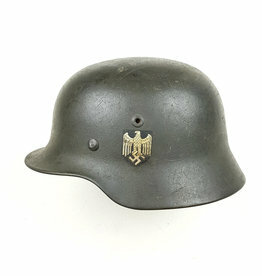 Wehrmacht army Marschkompass with is original box (without closing piece) and its original instruction card still present. 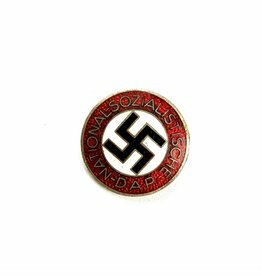 This is a nice original enameled NSDAP membership badge. The badge is in good used condition, the backside shows some oxidation. Maker and RZM marked. 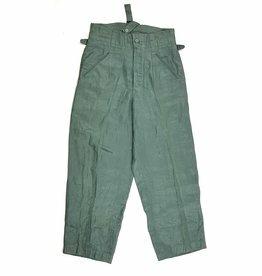 This is a pair of Luftwaffe HTB 'Drillich' trousers. The trousers are in unissued condition. The trousers are made of field grey HBT cloth. German WWII manufactured 1939 dated carrier for two 'Tellermine 35' mines (2T.Mi.35). The mine carrier in original Normandy camouflage paint.